We recently went back to the 1980s to check out Project A-Ko, but thanks to a recommendation left on the YR Facebook page, another old anime with yuri undertones has been brought to our attention, Fight! 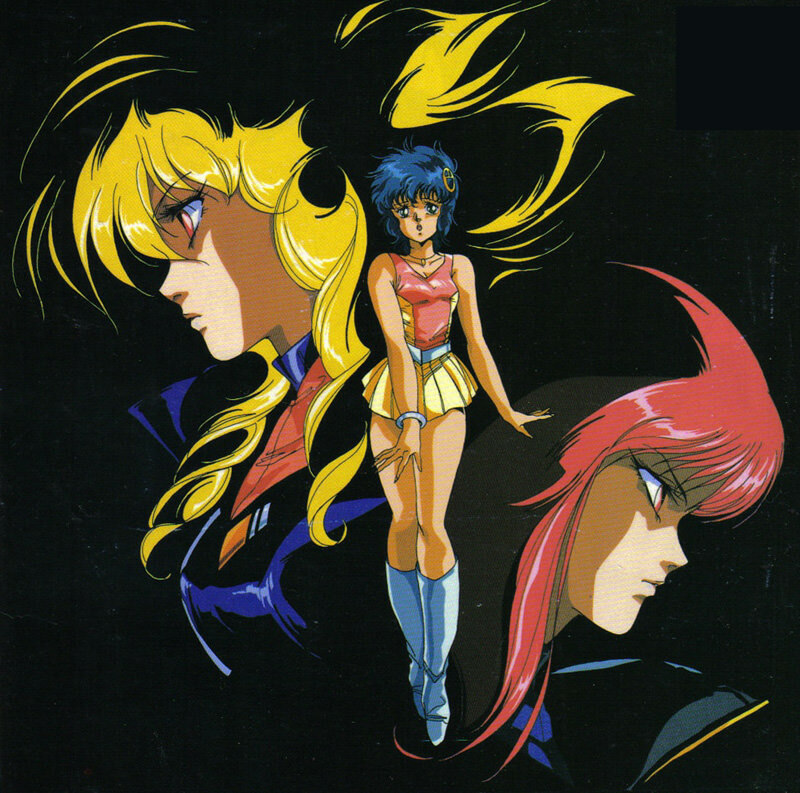 Iczer-One. Never heard of it? Me neither, but who cares? Let’s review it anyway! Synopsis: Nagisa is a schoolgirl with schoolgirl tendencies, waking up late, rushing off to school and meeting up with friends upon the way. One morning, Nagisa comes across a woman dressed in a strange uniform who seems to stare at her, unnerving Nagisa. Later that day, whilst staring out the window, Nagisa becomes aware of a ball bouncing by itself which flings itself towards her window seat, shattering the glass yet not harming her… Turning back to the front she finds a gaping mouth bristling with teeth inches from her face and no-one else about. She screams and the world returns to normal with her standing and the centre of curiosity of her class… why did she scream? Simply put, Fight! 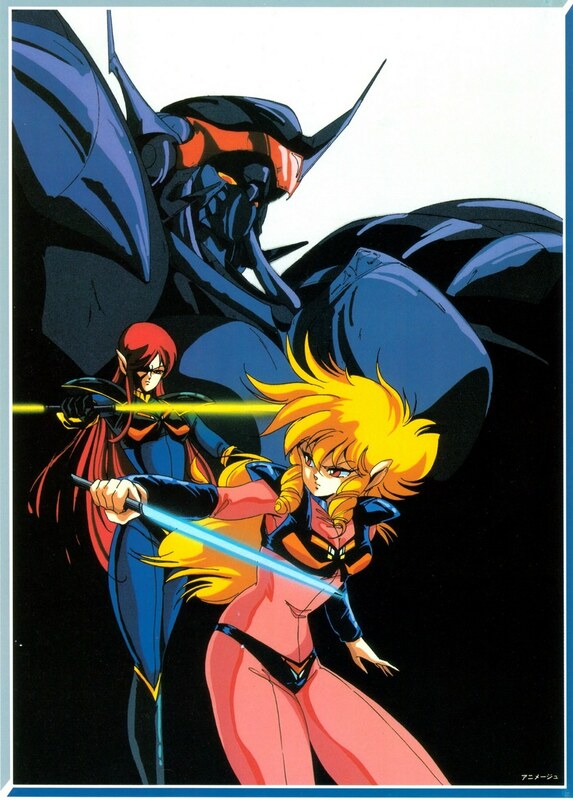 Iczer-One centers around an alien invasion of Earth, with a mysterious being named Iczer-1 being the only hope to protect humanity from the space invaders. The story plays out in a pretty campy fashion, and it mostly devolves into a simple tale that we’ve seen done over and over and much better than this. 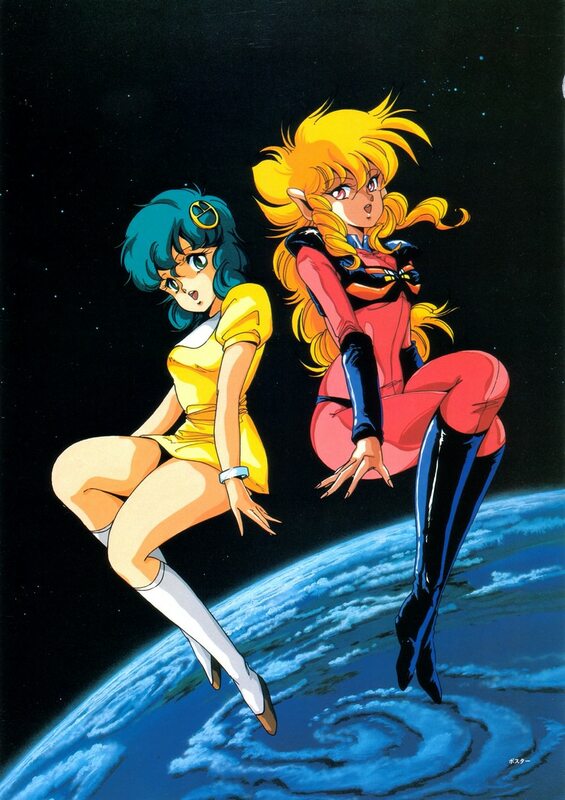 In order to help stave off the invasion, Iczer-1 needs a partner to synchronize with and help pilot her mecha, and it seems she just randomly chooses Nagisa, a normal highschooler. What follows is a lot of Nagisa refusing to join Iczer-1 and I-1 having to defend Nagisa (as well as herself and the Earth) from the Cthulhu, which is the name of all-female alien race that’s doing the invading. The story does a really poor job of fleshing out Iczer-1, Nagisa, or really any of the Cthulhu members, and it seems the battles between Iczer-1 and the Cthulhu forces take precedent over any meaningful worldbuilding. Coming into this, my expectations for the story weren’t incredibly lofty, but I was still disappointed how vanilla everything and everyone was made out to be. Something I did like about the story were the horror elements, as the Cthulhu mostly use parasitic creatures to do their dirty work and kill off humans. If you’re a fan of gore and entrails, you’ll certainly like seeing people explode when the parasite emerges from within their bodies and takes it over. The action sequences in this OVA were also fairly entertaining, even if they’re not the most spectacular mecha battles you’ve ever seen. And then there are the final two battles, which were really anticlimactic. This is after a major turning point in the story, and each of these battles are over in the blink of an eye. The lead-up to those battles was good—as were the closing scenes that came afterwards—but reducing formidable enemies into essentially cannon fodder probably wasn’t the best way to close things out. Oh, and I also hated the final outcome, which just hits the reset button and passes it off as a happy ending. Not cool, man. Overall, I felt like the story had some interesting ideas and characters, unfortunately, a lot of those are glossed over and neglected, so the end result was a pretty underwhelming story that definitely could’ve been better. Talking a little more about the characters, they’re about as underdeveloped as you can get. It isn’t until the midway point of the final episode that we get any sort of information on Iczer-1, and since Nagisa is just an ordinary student that’s often stuck playing the damsel in distress, neither lead offers much in terms of character depth. Sadly, Nagisa isn’t any better. She alternates between damsel in distress and mother bear to a little girl whose mother was killed, and I just don’t think she was very interesting. What was interesting was her relationship with Iczer-1. Unbeknownst to her, Nagisa was chosen by Iczer-1 to be her partner, though Nagisa is not at all willing to go with it. When asked why she chose Nagisa, Iczer-1 just says because she likes her, and isn’t that a good enough reason? That sounds good, but their relationship doesn’t really come across as romantic, and Iczer-1 spends way too much of her time acting as Nagisa’s knight and protecting her from the Cthulhu (and she’s not always so great at it). I would have liked to have seen Nagisa as a more willing partner to Iczer-1, but later on, she kind of tries to play that role, so better late than never. One of the best scenes in the OVA is near the very end, though, as much as I enjoyed it, the scene at the very beginning with Cobalt and Sepia had me hoping that’s what we’d see from I-1 and Nagisa, and that was just never the case. Even more so than the two heroes, I thought that the villains were pretty interesting. As I just mentioned, one of the very first scenes shows two Cthulhu women who happen to be lovers, Cobalt and Sepia, and were treated to yet another yuri kiss to add to our collection. It should come as no surprise that their romance doesn’t have a happy ending, but the fact that they’re canon already gives them a leg up on Iczer-1 and Nagisa. Big Gold is the main baddie, but he/she/it is another character that’s woefully underdeveloped and underutilized, and it’s a shame, since the tiny amount of exposition offered paints them as very interesting. In addition to Big Gold, Iczer-2 is Iczer-1’s primary rival over the course of the anime, and that rivalry drives nearly the entire story. She falls into the same trap as the other characters, and even though her only reason for existing (like I-1, she was also created by the Cthulhu) is to kill Iczer-1, she’s essentially the foil to I-1 that fuels the best moments in this anime. Lastly, Sir Violet is the leader of the Cthulhu, but she’s under the thumb of Big Gold, and she ultimately doesn’t contribute much to the story. Both her and Big Gold just mostly stand (or in Big Gold’s case, float) around and look and sound the part of an evil , and their unwillingness to get directly involved just drove me crazy. For anime this old, how to judge the animation is something that I’m not quite sure how to do, so you should definitely take my score with a grain of salt. It was also a problem for the Project A-Ko review, but since there’s only a DVD available for that movie, it’s a different situation. In addition to DVD, Fight!! Iczer-1 is also available on Blu-Ray, so the visual quality is much better now than it was in the mid 80s, and that further complicates the situation. Maybe it’s just me, but there’s something quite charming about really old anime. Perhaps it’s seeing the graininess of the outlines or perhaps it’s just knowing that animation has come so far in the past few decades, but this is one of those older anime that seems, for lack of a better word, more “natural” than the anime we see today. Nowadays, everything just looks so clean and polished, while the older stuff looks like it came straight off an artist’s sketchbook. You can see the dust that was on the cels, there are some frames that appear blurry for some reason, and I kind of like seeing all of those flaws. What I liked most was when a character would become possessed by the parasitic lifeform and explode like a piñata filled with viscera. Yeah, it sounds gross (and it kind of is), but those transformation sequences look a lot nicer than I thought they would. Prior to this, the oldest anime I’ve seen is probably Akira (1988), and while Fight! Iczer-One certainly isn’t on that level, I think it still looks quite nice. So, especially on Blu-Ray, I thought the visuals look good, but I was definitely less impressed with the audio. I’m sure that what we’ve come to expect from an anime soundtrack has changed a lot in the past thirty-three years, so, again, it’s not really fair for me to criticize the music. That said, I thought that the music didn’t really add a whole lot to the experience, and it definitely lacks the emotional punch that you’ll often find in more modern anime soundtracks. The horror-oriented scenes especially suffered from a lack of necessary tension, and because of it, I thought those scenes were a little compelling than they could’ve been. Unlike the music, the voice-acting didn’t seem out of place at all, and if you didn’t know, you would never think this was such an old anime. So, the music hasn’t exactly aged very well, and that keeps my score from being higher, but it’s not bad per se. Overall, if you can get past the old-school aesthetic, there’s a decent sci-fi anime waiting for you. The story and characters have some major flaws, the yuri is a little underwhelming, and the dark and serious tone isn’t for everyone, but if you’re into horror or mecha anime, this could possibly appeal to you. This entry was posted in Anime, Anime Review and tagged Fight!! 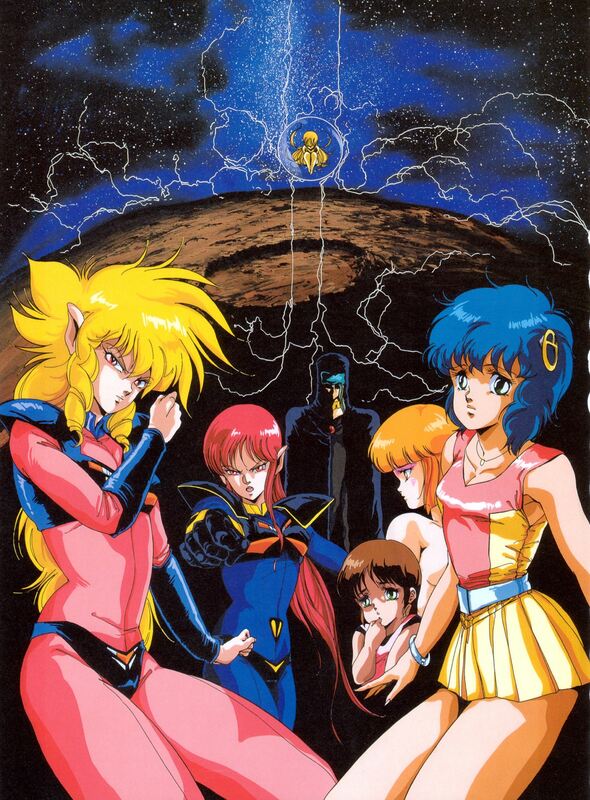 Iczer-1 by Rock The Vogt. Bookmark the permalink. What a coincidence, I just started a re-watch of Abyss (dubbed version this time) myself.